Every girl from childhood dreams of the most beautiful wedding. Indeed, this is a magical and loving day and I want everything to be perfect. It is necessary to approach this event responsibly and think through every detail. You should not even talk about the importance of a wedding dress for a bride, because every girl dreams of becoming a princess on this day, being fabulously beautiful and looking amazing. But how to choose the right bouquet for this event? After all, he is the main complement to the image of the bride. 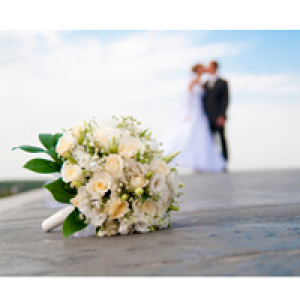 To begin with, you need to decide what kind of wedding will be. If it is thematic, then choose a bouquet that will be a bright accent and will correspond to the wedding theme. If you want a refined and elegant wedding, the image of the bride will complement the bouquet of cream, gently pink or snow-white roses. Very often, peons are used instead of roses, which will add to your image of special tenderness. Naturally, the color scheme of these bouquets directly depends on the shade of the bride's dress, shoes, accessories and her preferences. It is important that everything complement each other and look harmonious. Choose the bouquet itself after you have decided on the dress, jewelry and even make-up! After all, this is how you can choose a bouquet that will complete your appearance and make it unforgettably beautiful. When planning a trip to the florist, take a photo of the dress, and tell us about the style of the wedding itself, the shades of make-up, the features of the hairstyle. If you chose a gorgeous dress, you can decorate your image with a traditional round bouquet. If the dress is narrow and fitting, such a bouquet will not be in harmony with your image, you need to select cascading, teardrop-shaped compositions. Very often in such cases, flower garlands are used. Just pay attention to the decor of the handle of the bouquet. After all, this, it would seem, trifle can be a good addition to the chosen style of the wedding. If you want the bouquet to look organically and naturally you can choose a bouquet on your stems. Now it is very popular to tie them with ribbons (or cloth) in the tone of the color scheme of the wedding. It should be noted that the handle should not look unnaturally long. This can spoil the entire image of the bride, especially in photographs. In addition, the wedding bouquet should not be very big and heavy, because it will have to be held for several hours. Also, large bouquets deprive the image of the bride of tenderness and elegance, often look inorganic. Remember, it is only an obligatory detail, the accent of the image, and not the main attribute. The wedding season also plays an important role. As a rule, colors and shades are divided by the seasons. In summer, a combination of bright colors looks great, in the fall - red, yellow, orange. In winter, white and cool red shades are usually chosen, but in the spring they are composed of gently pink flowers. If this color scheme does not suit the chosen dress, accessories, wedding style, then you need to choose those shades that will look harmonious and correspond to your preferences. Do not forget that not only flowers, but also their decoration should be combined with the wedding dress and make the bouquet interesting. But you need to remember that everything is fine in moderation. 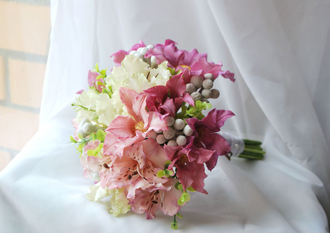 It is worth noting that in the wedding bouquet you can not use flowers with a strong flavor. A strong aroma of flowers can cause a headache and not very good health. Discuss with the florists what flowers will be present in the bouquet. If on any of them you have an allergy, be sure to tell the florist. To create a more harmonious picture, the groom can order a boutonniere, which will be collected from the same colors as the wedding bouquet.